Billions of people around the world believe in God, yet they will tell you many different, and sometimes contradictory, things about him . . . . or her . . . . or it . . . . or them. In this section you will find information on the major world religions, who started them and when, and how their teachings and practices compare. The 10 most important facts about the 12 largest religions in the world, whose adherents in total make up 80% of the global population, summarised into one large table for easy comparison. Here I summarise the teachings of the 8 largest religions in order of number of followers – Christianity, Islam, Hinduism, Confucianism & Taoism, Buddhism, Sikhism and Judaism. 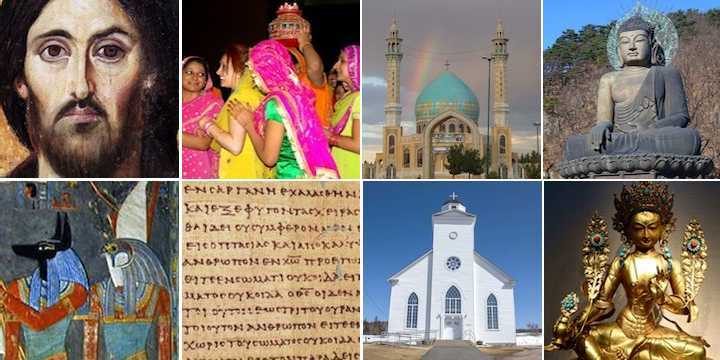 There are many differences between the world’s religions, but are they all the same underneath? It turns out that there are four quite different types of religions – Monotheistic (Middle Eastern), Dharmic (Indian), Taoic (Chinese/Japanese) and animistic or pagan. A summary of the main beliefs of Buddhism – the life of the Buddha, the essential teachings of Buddhism, other teachings and practices, different types of Buddhism, modern Buddhism, comparison with other religions and useful references. A summary of the main beliefs of christianity under the following headings – what christians believe, why they believe it, other teachings, and how christians believe people should respond to this information. I am following this up with more detailed information on the major religions – so far I have only summarised what Christians and Buddhists believe, but later there’ll be information on Islam, deism and atheism. Could anyone believe in a God who punished people in hell forever? I examine the philosophy, ethics and theology of hell, and find that it is extremely doubtful that Jesus taught about the hell of traditional christianity, and good reasons to reject that view. How many christians are converts, and how many grow up in the faith? I couldn’t find good answers to these questions, so I decided to do some research and analyse the data myself. The answers were interesting, and maybe a little surprising. Photos: Wikimedia: Jesus, Wikipedia: Egyptian gods, Ancient document and MorgueFile: Sikh women, Mosque, Buddha, , white church, Hindu goddess.